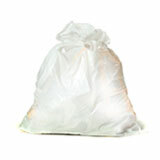 These heavy grade high density trash bags are 16 microns thick. 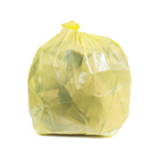 If you’re not throwing away anything super sharp, garbage bags made from High Density Polyethene (or HDPE, if you like) are a really smart choice for kitchens, bathrooms, or offices. 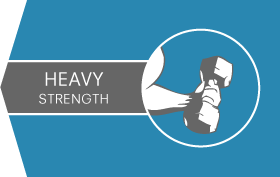 Because they can hold so much weight in spite of being thinner than your average germ, high density can liners work well with wet trash, like food waste. They also cost quite a bit less than their low-density counterparts, because they use a lot less material when they are made. You’ll often find these 16 micron thick garbage bags being used for laundry: they can cope with the heavy loads, and if you choose clear trash bags, it’s simple to see what’s inside. 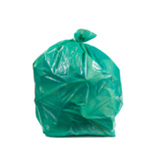 They also make handy recycling garbage bags in municipalities which require a clear bag for recyclables. 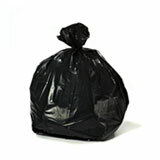 Choose our black high density garbage bags if you’d prefer to hide the contents a bit better. 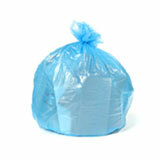 These bags are excellent commercial garbage can liners for busy cafeterias, shops, and other high traffic spots. 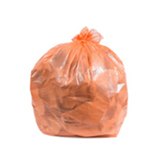 At this thickness we offer a trash bag that is specially designed for 56 gallon Glutton can which is so popular both in kitchens and out back. 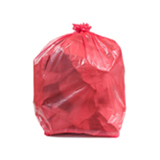 Buying wholesale trash bags for the first time can be intimidating, but it doesn’t have to be. 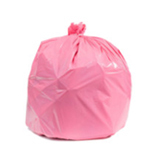 Just get in touch, and let us help you select the perfect wholesale garbage bags for your home or business. We’re experts, and we’re proud of it. Like a tailor fitting a gentleman for his suit, we won’t rest until we’ve found the bag that is the right fit, material, and color for your needs. 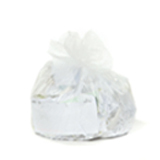 All the bulk can liners we sell are covered by our heartfelt 100% satisfaction guarantee. 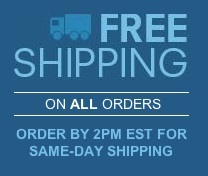 We’ll ship the bags on the day you order. When they arrive (right to your doorstep!) if you have any more questions or concerns we’ll jump at the chance to make you happy.